Choosing wine – what a confusing exercise! There are different brands, different price-points, different regions, different styles, large producers, boutique producers, varieties, blends of varieties, different vintages – the list goes on. The stakes can be high – you may be outlaying $20 on something you’ve never had before and never heard of. If you’re buying a case online, that $20 suddenly becomes a $120 or $240 outlay. If it is for a work event or an occasion for friends or family, you need it to be a good choice. Choosing wine can be the single most confusing and intimidating part of the wine experience, especially for those of us who aren’t sommeliers (my hand is up)! One of my goals in building Wine Wisdom Made Easy is to help you to choose great value wines with confidence. When I am choosing wine, my goal is to get the best wine for the least money. I love bargains, and I especially love being confident in my choices. I think the best approach is to learn some basic principles about choosing wine that you can apply anywhere, any time you need. Sure, you can have a database of thousands of wine reviews in a book or app on your phone to consult when at the bottle shop (these can be useful too). However, I am a firm believer in the idea of ’teaching a person to fish’ rather than providing the fish every day (to borrow from the proverb). The principles I have outlined below are simple enough to carry around in your head for life – no subscription required! My preferred sweet spot for great value is $15-$25 (in an Australian bottle-shop or online – this would equate to $35-$50 in restaurant prices). I think you can get the best value in this range, especially under $20. It is one of the most competitive segments that high-quality wineries are usually competing in for the majority of their sales. As detailed in this article, choosing the right growing region for the variety of grape or style of wine you want is the single most important consideration. Once you have decided what variety or style you want, make sure you choose one of the best regions. For example, choose Semillon from the Hunter Valley. 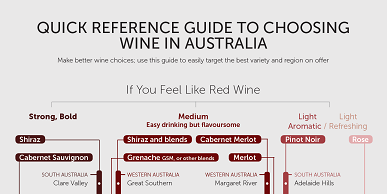 You can download your free guide to matching region with wine style or variety here. If the label says ‘South Eastern Australia’, walk away. Look for recognisable, yet specific regions like Hunter Valley, Margaret River, Mornington Peninsula and Yarra Valley. Exceptions to this include Tasmania (Most wines from Tasmania will be of above-average quality). Legally, if there is a region specified on the front label, the wine must be (at least 85 per cent by volume) made from grapes grown in that region. Consistently award-winning, highly regarded wineries have high standards of quality in all stages of grape growing and winemaking; this quality flows down to their cheaper labels. Just be careful to make sure their cheaper wines come from the same region as their expensive ones (and ideally, estate grown, meaning they come from the same vineyard). If you can, compare their top-shelf wine against the equivalent cheaper label, and check for differences around claims on the front label. To find the high-end wineries in a bottle shop, look in the expensive section and then ask to see the cheaper wines from the same producer. Some regions just don’t get the credit they deserve while others can charge a premium price and still sell bucket-loads of wine based on their proximity to major cities. Classic examples of under-valued regions include Clare Valley (SA), Great Southern (WA), Macedon Ranges (VIC), Central Ranges and Hilltops (NSW). So, next time you are choosing wine, try the above principles to get great value. Even if you only apply one of them to begin with, you’ll find that it simplifies your choice and gives you consistently better value wines. You can get started by downloading your free guide to choosing wine, below. As an optional extra, you may want to go for specific years or ‘vintages’. I have excluded it from the main list above because unless you keep on top of such things, it is a little trickier to track. A great resource for checking vintage ratings is James Halliday’s Vintage Chart.